A new cogeneration installation was in the process of being commissioned when severe subsynchronous vibration was detected on the generator during no load tests. Subsequently, two rotordynamics problems were discovered. These problems prohibited the steam turbine generator set from reaching full speed. Additional vibration problems were anticipated once the generator was loaded and the steam flows through the turbines increased. 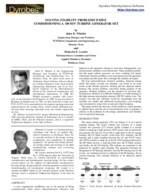 The first subsynchronous vibration problem, observed during initial full speed, no-load run attempts, was found to be most severe at the inboard generator bearing and the adjacent turbine bearing. The second problem, uncovered during analysis of the generator vibration problem, was the presence of low-level subsynchronous vibration at a different frequency on both bearings of the high pressure-intermediate pressure (HP-IP) turbine rotor. The concern was that this vibration would be exacerbated once the machine was loaded and additional aerodynamic cross-coupling was introduced by steam flow at seal and wheel locations. This paper details the discovery of the problems, initial attempts to address them, and the use of rotordynarnics tools to engineer a solution to the problems by the design, manufacture, and installation of optimized bearings.